We’re bummed to say it, but motorcycle theft happens a lot more than we’d care to admit. And trust us when we say, we don’t want your bike to be next. Lucky for all of us, there are plenty of tips and awesome bike accessories to help prevent motorcycle theft. So let’s start with a few basic tips to keep your bike protected. Keep it stored or covered - Your bike will be a lot less tempting if criminals can’t see what they might want to steal. If you have a garage we suggest keeping your bike in it, and if you don’t, we suggest investing in a bike cover. Storing and covering your bike will not only keep thieves at bay, but it’s just all-around good practice to keep your bike in top shape. Add a security alarm - We do not recommend relying solely on an alarm, but they can deter thieves. Many companies are creating motorcycle security alarms, just like the ones you see on cars. Check out Gorilla’s Automotive 9100 Motorcycle Alarm with 2-Way Paging System. Lock your ignition and remove the key - Many bike thefts occur when the motorcycle’s ignition is turned off but not locked - so be smart and take the extra minute to lock your ignition. Use your kill switch - If you use your kill switch, your engine won’t start until your key signals the bike which disables the kill switch. If for some reason your bike doesn’t have a kill switch we highly recommend installing one. You also have the option of installing a hidden kill switch (if your bike doesn’t already have one), which can further enhance your motorcycle’s security. Lock your bike to a stationary object - Locking your bike to an object that cannot be moved is always a good idea. We suggest getting a heavy-duty cable or chain lock from Kryptonite. Thieves are likely to be deterred from stealing because they would need to cut through the cable, giving them more time to get caught in the act. If riding with friends, it’s also a good idea to lock all of your bikes together. Invest in a disc lock - A disc lock is a widely used anti-theft device that uses the holes in your bike’s brake disc. It blocks the bike from being moved in either direction and can deter thieves. They are usually portable and small - check out the MysBiker Disc Brake Lock. Park near security cameras - If possible, it’s a good idea to park your bike near a security camera. If your bike is stolen, you could have the chance to get a description of the individual that stole your bike. Get a GPS tracker - Although a GPS tracker cannot prevent your bike from being stolen, it can come in handy if the unfortunate event should ever occur. A tracker is great if you want to track your bike’s movements, so you can contact the police and get your bike returned quickly. Check out the Spy Tec STI GL300. Let’s face it - thieves are out there. But if you follow even just one or two of these tips you’re off to a good start on keeping your bike protected. 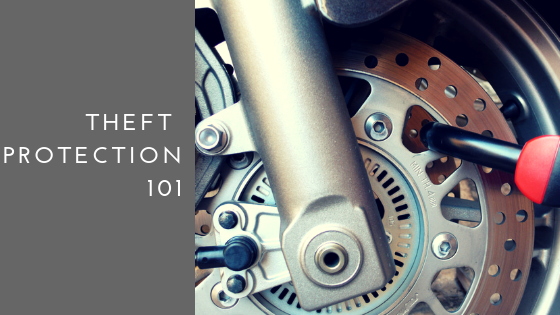 Do you have any tips or tricks for motorcycle theft protection? Let’s hear them. Share your thoughts in the comments below.